The spinels are an important group of oxide minerals with similar crystalline structures. Their general chemical formula may be written as (X)(Y)2O4, in which X and Y represent cations of various metals. They are named after the representative mineral spinel, which corresponds to magnesium aluminum oxide (MgAl2O4). This group consists of more than 20 minerals, including valuable ores such as chromite, a source of chromium; magnetite, a source of iron; and franklinite, a source of manganese and zinc. The representative member, spinel, produces gem-quality stones. In particular, spinel-rubies are red spinels that resemble rubies and are used as gemstones. Spinel (MgAl2O4): This representative member of the group can be found in a range of colors, including red, pink, blue, green, violet, brown, and black. The red variety appears like a ruby and is valued as a gemstone. Chromite ((Fe,Mg)Cr2O4): This black mineral is the main ore of chromium. It is also a component of refractory (heat-resistant) materials and dyes. Franklinite ((Fe,Mn,Zn)(Fe,Mn)2O4): This black mineral was named in honor of Benjamin Franklin and is found in Franklin, New Jersey. It is an important source of manganese and zinc. Gahnite (ZnAl2O4): A rare mineral, it can be found in various colors, including dark blue-green, yellow, brown, and black. Hercynite (FeAl2O4): Dark blue-green, yellow, or brown in color, it was discovered in Silva Hercynia, the Latin name for the Bohemian Forest. Jacobsite (MnFe2O4): Named after Jakobsberg, Sweden, it is usually black or gray in color. Magnetite (Fe3O4): This black or gray mineral is one of several iron oxides and an important ore of iron. Trevorite (NiFe2O4): This rare variety of spinel is black with a brown or green tint. Ulvöspinel (TiFe2O4): This black or brown spinel was named after Ulvö Island, Sweden, a mining area for iron, titanium, and vanadium. Spinel is found as a metamorphic mineral and as a primary mineral in basic rocks. In such magmas, the absence of alkalis prevents the formation of feldspars, and any aluminum oxide present will form corundum (aluminum oxide) or combine with magnesia (magnesium oxide) to form spinel. For this reason, spinel and ruby are often found together. True spinel has long been found in the gemstone-bearing gravel of Sri Lanka and in limestones of Myanmar and Thailand. As noted above, the general chemical formula for the spinel group is (X)(Y)2O4. In this formula, "X" and "Y" represent various divalent, trivalent, and quadrivalent cations, including the cations of magnesium, zinc, iron, manganese, aluminum, chromium, and titanium. Also, "O" represents the oxide anion. Spinels crystallize in the isometric (cubic) system, usually with an "octahedral habit"—that is, outwardly shaped as octahedrons. The crystals are most often twinned. The oxide anions are arranged in a cubic close-packed structure, the X cations occupy tetrahedral sites, and the Y cations, octahedral sites. For "inverse spinels," half the Y cations occupy the tetrahedral sites, and both X and Y cations occupy octahedral sites. Spinels have an imperfect octahedral cleavage and a conchoidal fracture. Their hardness is about eight on the Mohs scale, and their specific gravity is 3.5-4.1. They range from transparent to opaque, with a vitreous to dull luster. Some spinels are colorless, but they are usually in various shades of red, blue, green, yellow, brown, or black. A unique white spinel, now lost, surfaced briefly in Sri Lanka. Several spinels—such as chromite, magnetite, and franklinite—are important ores of metals. 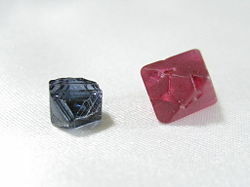 True spinel is the only member of the group that provides gemstones. The transparent red spinels are called spinel-rubies or balas-rubies and were often confused with actual rubies in ancient times. Yellow to orange-red spinel is called rubicelle. The famous Black Prince's Ruby in the British Crown Jewels is a spinel. ↑ Mindat.org. 2007. Spinel Mindat.org. Retrieved October 23, 2007. ↑ Amethyst Galleries. 2006. The Mineral Spinel Amethyst Galleries. Retrieved October 23, 2007. ↑ Mindat.org. 2007. Chromite Mindat.org. Retrieved October 23, 2007. ↑ Amethyst Galleries. 2006. The Mineral Chromite Amethyst Galleries. Retrieved October 23, 2007. ↑ Mindat.org. 2007. Franklinite Mindat.org. Retrieved October 23, 2007. ↑ Amethyst Galleries. 2006. The Mineral Franklinite Amethyst Galleries. Retrieved October 23, 2007. ↑ Mindat.org. 2007. Gahnite Mindat.org. Retrieved October 23, 2007. ↑ Mindat.org. 2007. Hercynite Mindat.org. Retrieved October 23, 2007. ↑ Mindat.org. 2007. Jacobsite Mindat.org. Retrieved October 23, 2007. ↑ Mindat.org. 2007. Magnetite Mindat.org. Retrieved October 23, 2007. ↑ Amethyst Galleries. 2006. The Mineral Magnetite Amethyst Galleries. Retrieved October 23, 2007. ↑ Mindat.org. 2007. Trevorite Mindat.org. Retrieved October 23, 2007. ↑ Mindat.org. 2007. Ulvöspinel Mindat.org. Retrieved October 23, 2007. ↑ The term balas is derived from Balascia, the ancient name for Badakhshan, a region in central Asia situated in the upper valley of the Kokcha river, one of the principal tributaries of the Oxus river. This page was last modified on 16 October 2015, at 16:10.